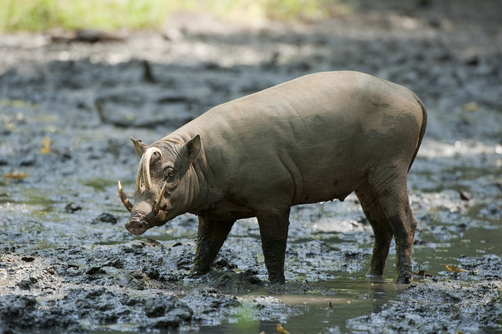 I am doing a project at school about the impact of feral pigs in Australia, so today I want to write about one of my favourite species of pig, the Sulawesi babirusa. These amazing looking animals grow to over 1 metre long and can weight up to 100 kg. They are the largest of the babirusa species. Sulawesi babirusas are best known for the male’s tusks. They are their canine teeth and the upper canines grow through their snout and curve back towards his eyes. They live in small groups, using their excellent sense of smell to find fruit, roots and leaves on the forest floor. They also eat small mammals and have very strong jaws and teeth. Sulawesi babirusas are found in the tropical rainforests of the island of Sulawesi in Indonesia. They are considered vulnerable to extinction due to hunting and habitat loss. Are there any other interesting facts that you would like to share about Sulawesi babirusas?